p(blue). Editor’s note: Today we are happy to introduce Kelly Myers, who will take over the Front Burner column from Helen Rennie. (Helen has turned her focus to teaching, blogging, and, soon, motherhood; we wish her the best in all her many endeavors!) A trained chef and two-time Culinate contributor, Kelly cooks at Nostrana in Portland, Oregon. Here, she addresses that beloved thistle, the artichoke. No one eats artichokes like the Italians do. In Italy, the artichoke is deftly manipulated in all manner of preparations: browned in wedges like a steak, stewed in tomato pulp, and transformed into pasta sauce. The Romans even deep-fry artichokes, which makes them open up like sunflowers and turn the color of aged leather. But here in the New World, artichokes are mostly a novelty vegetable that haven’t made it out of the steamer basket. It’s no wonder. Artichokes are thistles. Stripping them down to their edible hearts and tender leaves is daunting. Their bracts, or leaves, are stiff and fibrous, with little thorns on the tips. You could pat the artichoke on the back for guarding its pale heart so well, except that it might prick you. Even among restaurant cooks, known for putting up with tedious and uncomfortable work, the prospect of cleaning artichokes elicits groans and avoidance. In one of my favorite Italian cookbooks, Faith Willinger's Red, White and Greens: The Italian Way with Vegetables, there are 16 artichoke recipes, and they all sound good. By comparison, Willinger’s chapters on garlic and eggplant, iconic in the Italian kitchen, contain only eight preparations. Willinger does innocently note that every spring, Italian vegetable vendors demonstrate how to clean artichokes. Funny, I haven’t seen anyone doing that at my local grocery store. I’m not a seasoned produce vendor, but I will give you two ways to prepare an artichoke. The first is for stuffing, in which both the artichoke’s center and in between its leaves are filled, usually with a breadcrumb or sausage mixture. The other is for trimming an artichoke down to its heart, which is the basis of many Italian recipes. I think the prep is worth doing. Of course I’m going to say that; I cook professionally. But I can tell you that when artichokes are baked, braised, or stewed in olive oil with garlic, they take on buttery, nutty, and meaty qualities, flavors deeper than what you get from boiling or steaming. The following methods are for the globe artichoke, the large green artichoke that is most commonly available. If you can get locally grown artichokes, do buy them. They will be fresher and more flavorful. And they may be more pliable and have less choke to scoop out. You may want to wear food-service gloves (the tight-fitting kind, like at the doctor’s office, now widely available without latex) to protect your hands from scratches and stains. First, set up a bowl of acidulated water: Squeeze the juice of two lemons into 2 to 3 quarts of cold water, then throw in the lemon rinds. Hold prepped artichokes in the acidulated water until you’re ready to cook them; it prevents them from turning brown. Have a third lemon on hand, cut in half. Pull off the smallest bracts near the bottom of the choke, grabbing them and pulling them downwards towards the stem. Continue upwards, snapping off about 25 percent of the outer leaves. Using a serrated bread knife, cut (it may seem more like sawing) off the top of the artichoke approximately one and a half inches from the top. Discard the tops of the bracts. Immediately rub the cut surfaces with a lemon half to prevent browning. You will see shiny purple-tipped leaves in the center of the artichoke. These are covering the choke and may have thin thorns on their tips. Reach in and grab them all at once, pulling outward with a twisting motion. Use scissors to snip off the triangular tips of the remaining leaves. 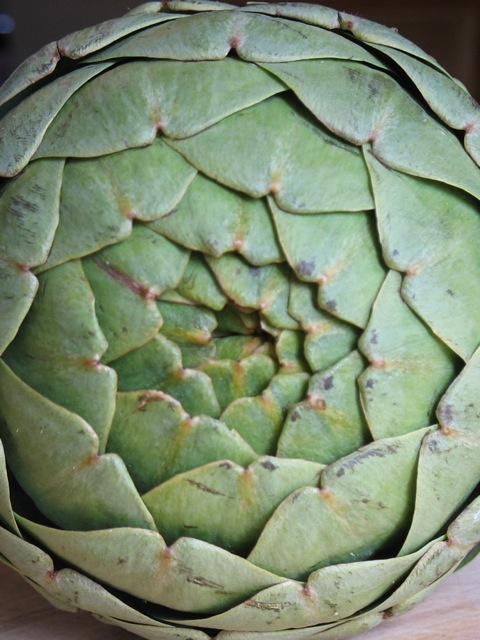 As you continue to trim, the artichoke will begin to resemble a petalled flower. Rub lemon over the leaves where you have cut them. Once the fuzzy, silky choke is exposed, scrape it out with a melon baller or a serrated grapefruit spoon. Be relentless and remove all the hairy bits, but don’t scrape away the edible flesh. Rub the heart with lemon. Trim off the stem, creating a flat bottom. If it is large, the stem may be trimmed down to its edible pale core, which can be sliced, sautéed until tender, and added to the stuffing. 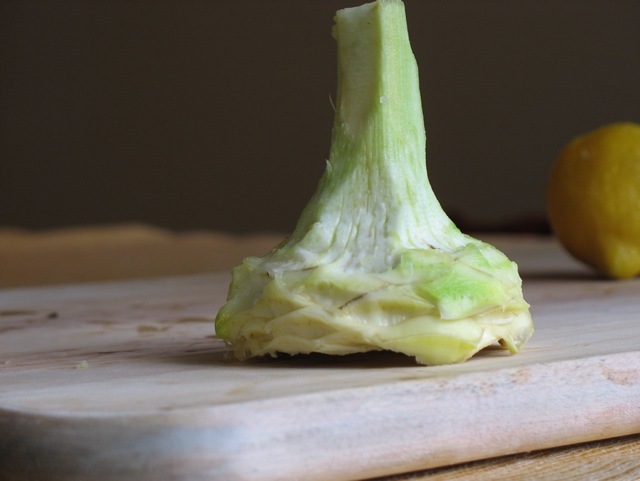 Using a sharp paring knife, go around the base of the artichoke heart, trimming off the inedible dark green parts. 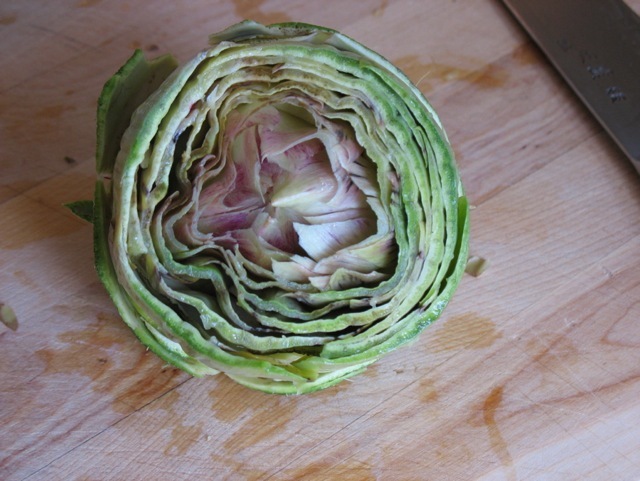 If you’re a beginner, the easiest way to do this is to rest the artichoke cut side down on the cutting board. (The experienced may want to hold the heart in one hand and trim around it like a lathe with the other.) Then trim downwards and outwards from the base of the stem. 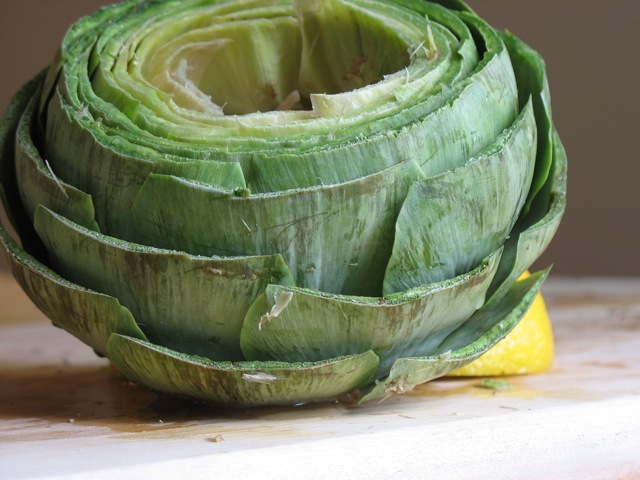 Hold the artichoke in acidulated water until you are ready to cook. Pulling downwards, snap off all the bracts, one by one, until you reach the choke. Pull away the purple-tipped leaves of the choke. Holding the artichoke by its stem, scrape off the choke with a serrated grapefruit spoon or a melon baller. Immediately rub the surface of the heart with lemon. Use a sharp paring knife to trim away all the dark-green parts, down to the palest, creamiest flesh. At this point your artichoke will start to look like a chalice. Slice an inch off the discolored bottom of the stem and trim the rest of it to its white core. 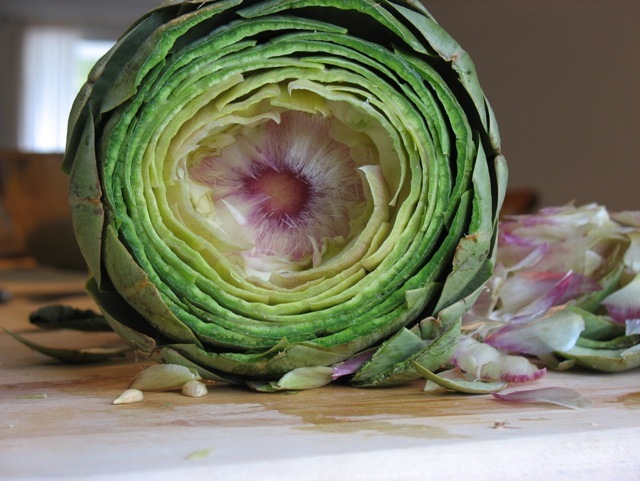 Hold the artichoke heart in acidulated water until you are ready to cook.